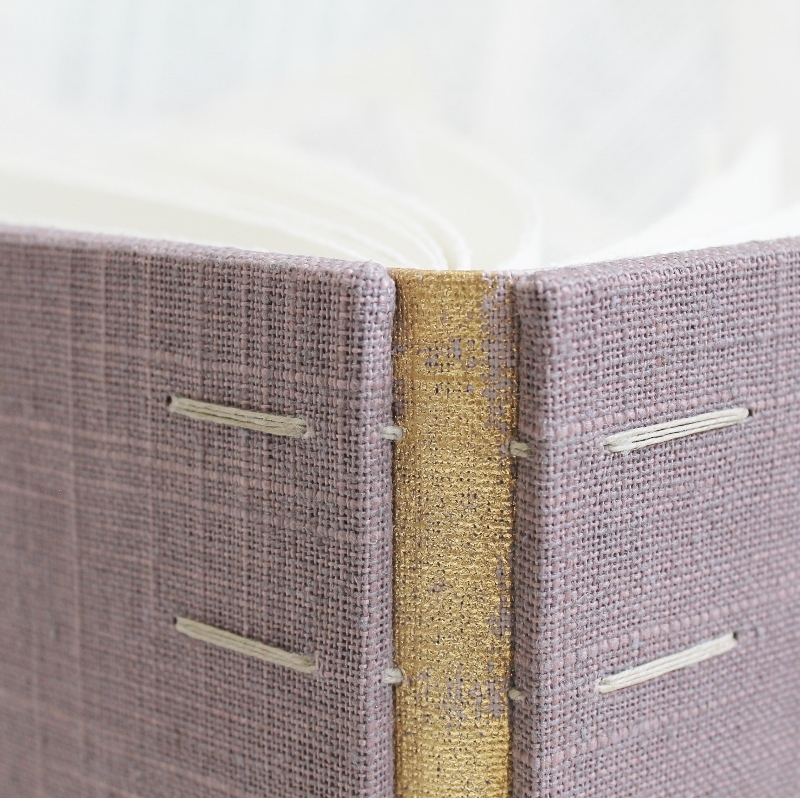 To balance out the bullet journal frenzy I've been on lately I finished a light purple linen guest book with a distressed gold spine and really pleasing proportions. I personally like the landscape format, especially for guest books - pages that are wider than they are tall stay open particularly well, and have a nice flow when leafing through the pages. 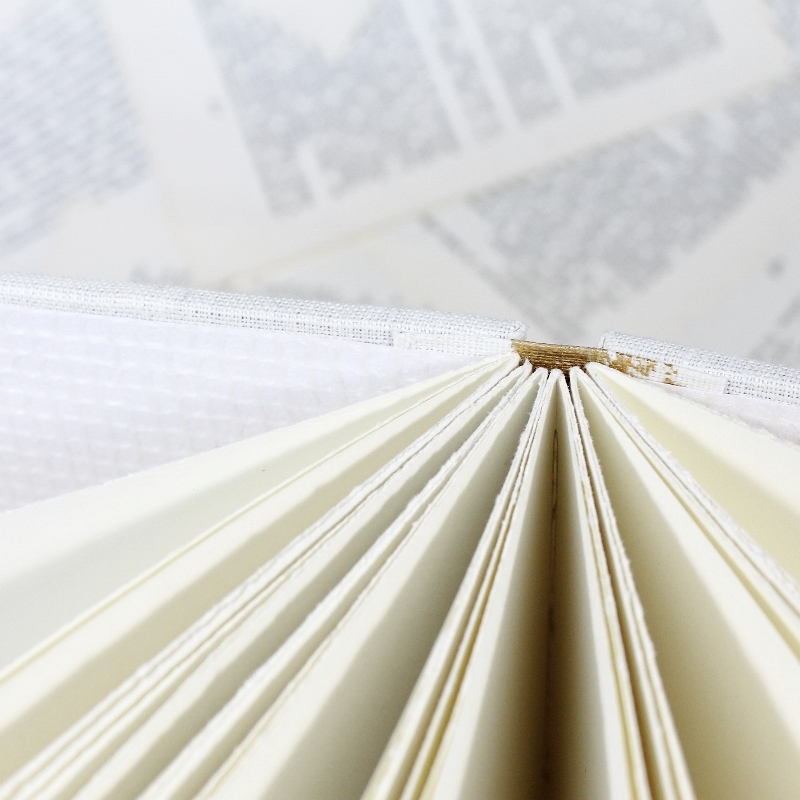 Somehow the tactile experience of handling a book is even more enjoyable than it is with portrait format books. 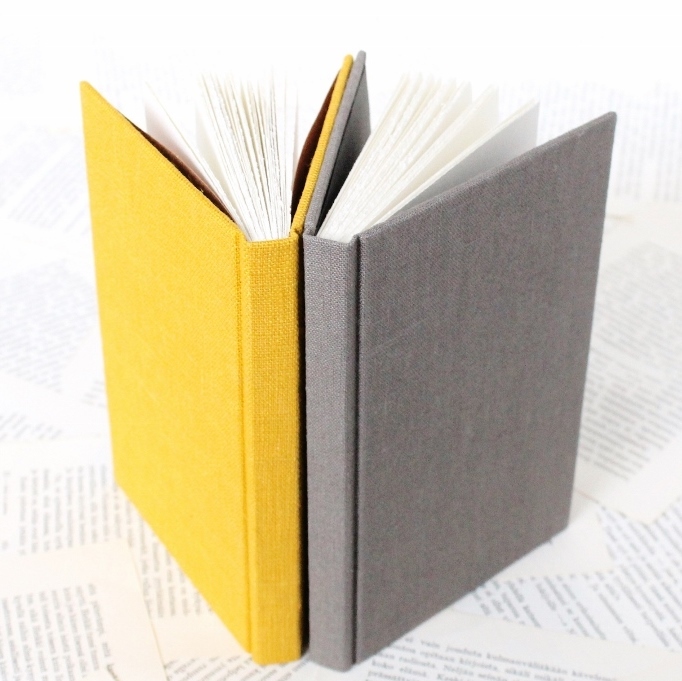 Speaking about what it's like to handle a book: I've now repeatedly read how people find it pleasing to crack the spine of their new notebook, how it's one of their favourite sounds, etc. - but, listen to me people, the spines aren't supposed to crack! 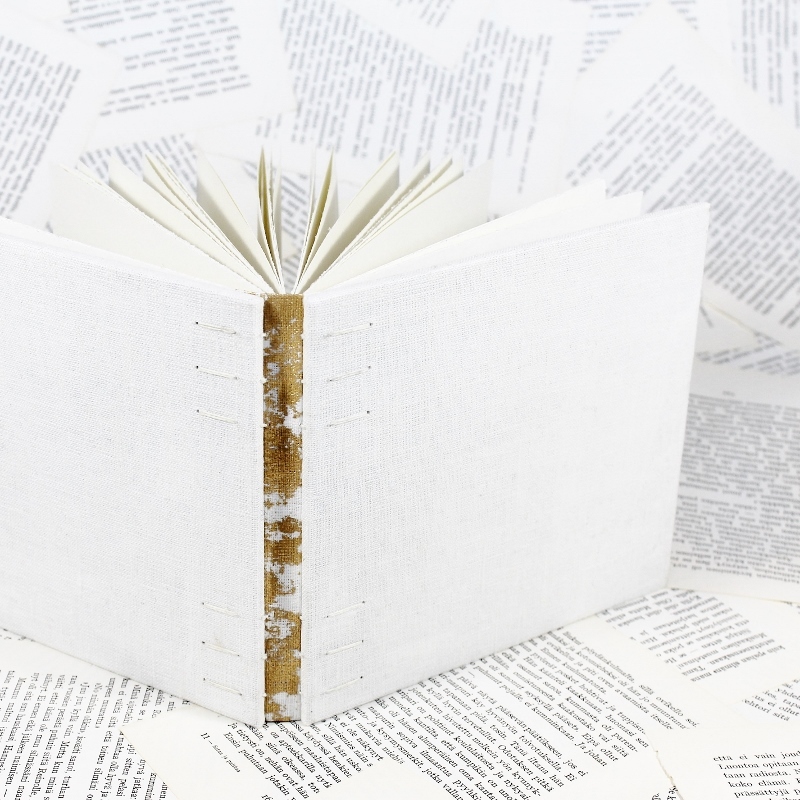 Cracking sounds mean there's something getting damaged there, and I don't believe it's a good thing that you need to damage your new book before you've even gotten to use it. 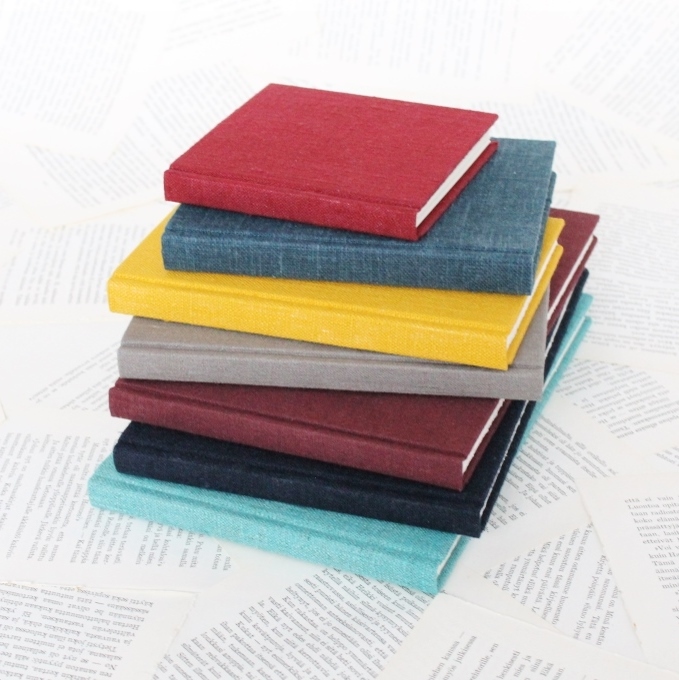 Well made (=usually skillfully handmade) notebooks won't crack when you first open them - they just open. The spine is supposed to be flexible enough to handle the process of repeated opening and closing without cracking sounds and damage. 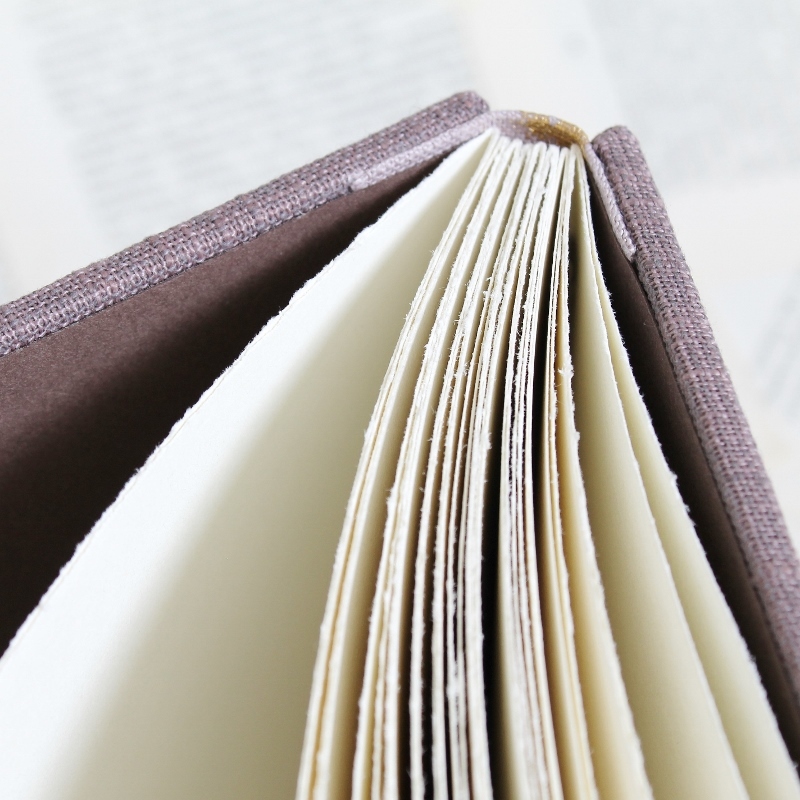 If you end up with a book that resists opening (either a notebook with a stiff spine, or pretty much any printed hardcover book you're about to read), please don't force it! 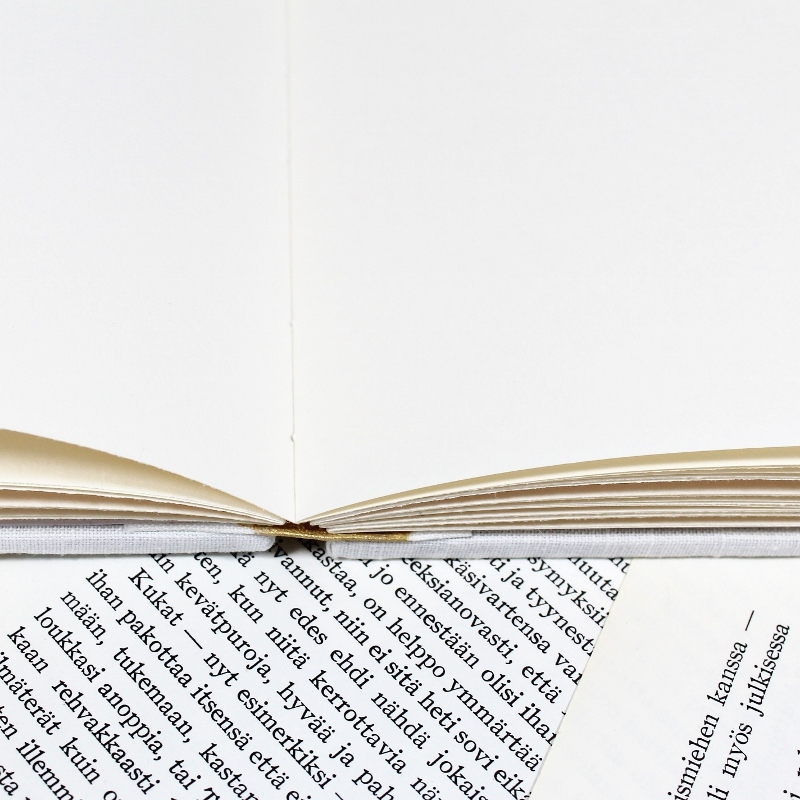 Here's a detailed tutorial on how to open a new book - it's worth a read if you want to extend the lifespan of your book. 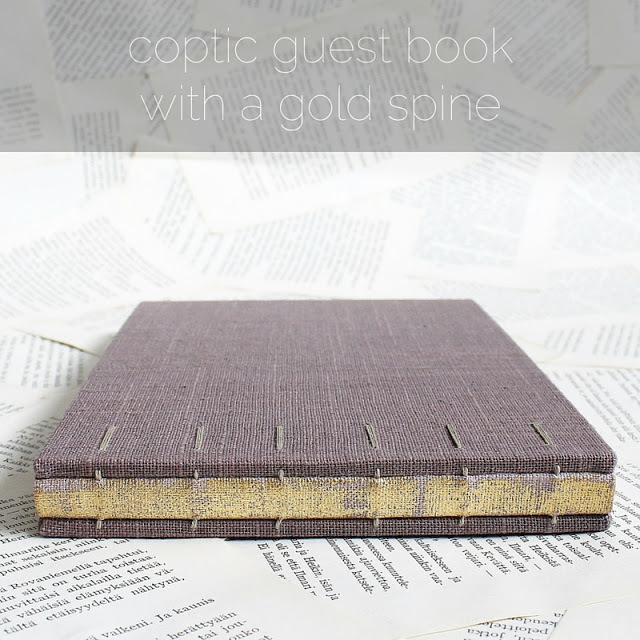 With Coptic bound books and other books with non-adhesive bindings the spine is guaranteed to not cause any trouble. Here the spine is covered with gilt linen, so the stitching is further protected from wear without causing any problems with the opening of the book. This week has been a busy one in my studio: many mixed media projects started and a big lot of different types of bullet journals are also in the making. I've gone through podcasts at a terrifying pace while working, so I welcome podcast recommendations in the comments section! My current podcast favourites include Radiolab, Modern Love, TED Radio Hour, This American Life and everything by Gimlet, but I also enjoy history, craft, and crime podcasts (separately, but I'd definitely be interested in anything that combined all three, too). Do you listen to podcasts? What should I go explore next? A duo of new books in the shop. 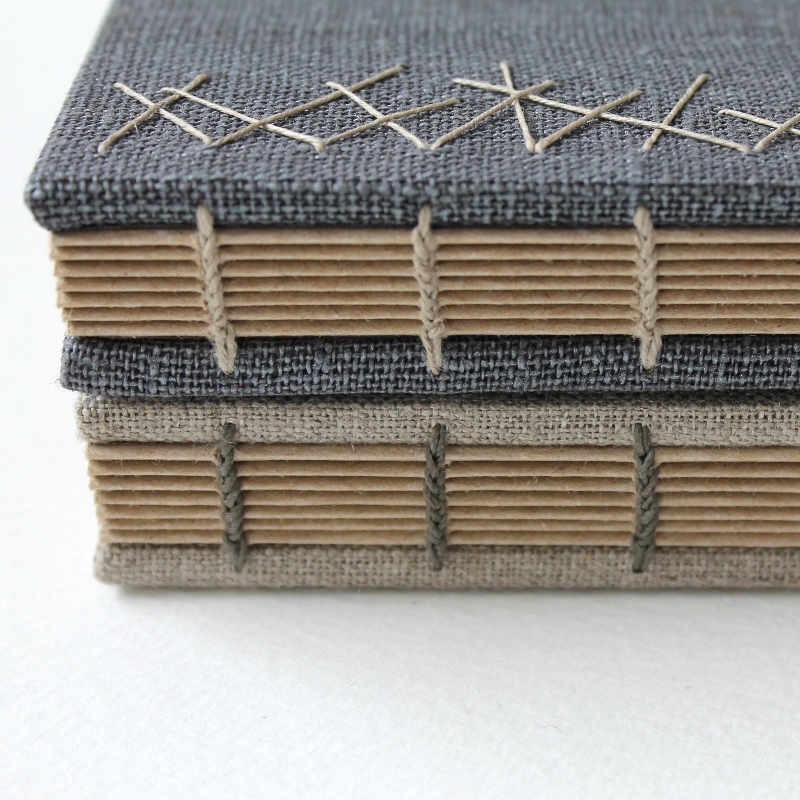 Metallic grey and natural linen. A few years ago I made this Coptic binding covered in gilt leather, and while I loved the look, I just couldn't make any more. The simplest reason being that I just couldn't make that many holes with my awl, unless I wanted to risk tenosynovitis, which is a constant threat - luckily nowadays much less so. Last October I unearthed the idea of criss cross stitching again, and used a Dremel type tool to drill the holes. It was alright, but there was a lot to improve upon. We've already discussed here how awesome fathers are, so no surprise here: my father went shopping. For drilling the holes for these books (and all other recent Coptics) I got to use a brand new Dremel Workstation, which is super great for this type of work. Most importantly, it's also quick, and easy on my wrists. I've never before liked using electric tools. I think they're a bit scary, but that doesn't really make any sense as it's quite possible to do a lot of damage with hand tools just as well, especially when the knives are as sharp as they are. Unsurprisingly my life is full of irrational fears, so maybe this recent success with an electric tool will help me tame some of the others, too. 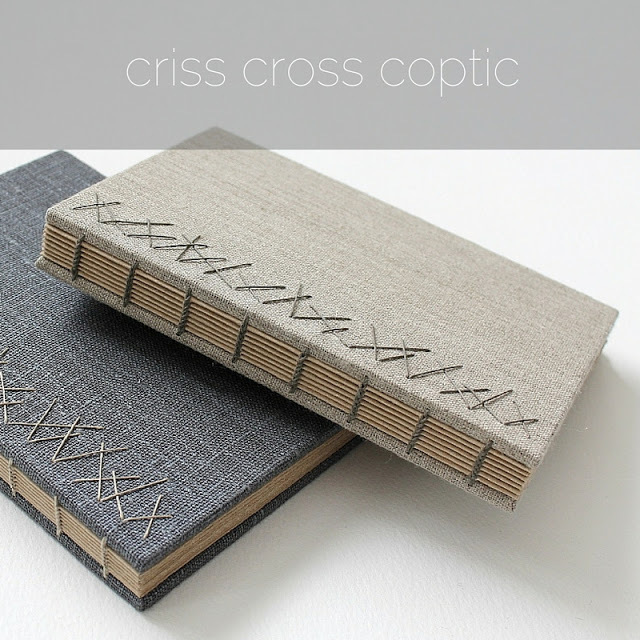 After I received an email requesting a link to a tutorial for Coptic books with linen spines (of such tutorial I have no knowledge of, but maybe one day I'll make one), I realised it had been years since I last made any. The situation has now been rectified after I finished these two books last night! The loose fabric spine gives the Coptic binding a little more support and protects the sewing on the spine from friction. The wedding guest book season is pretty much here already, so I decided to go with white linen for the first two of the lot I have in the making. 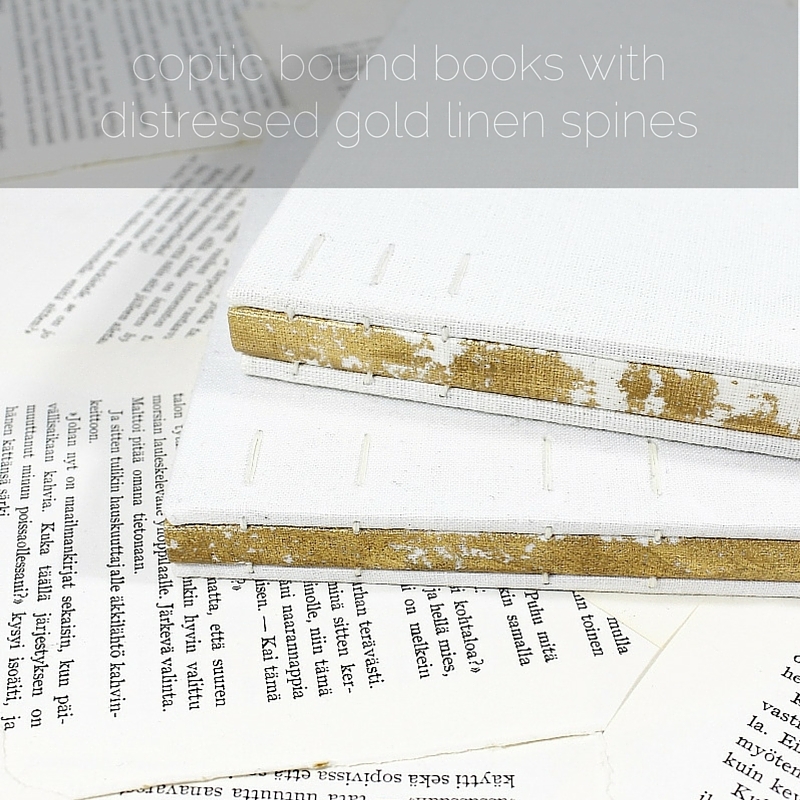 These spines were decorated using gold leaf and brushed to reveal more or less of the white linen underneath. I finished the spine strips with a coat of matte gel medium so they remain supple but don't carry on distressing themselves any further. On my quick visit to Turku last week I picked up this beautiful white handmade lace paper that has a wonderful silky sheen and a grid pattern. To me it's perfect for lining inside covers as I'm not too keen on using patterned papers (the minimalist I am, apparently) - its grid texture and pattern is neutral but still interesting and luxurious. See how perfectly the book opens! I'm so glad to have discovered a way to protect the spine without compromising flexibility. 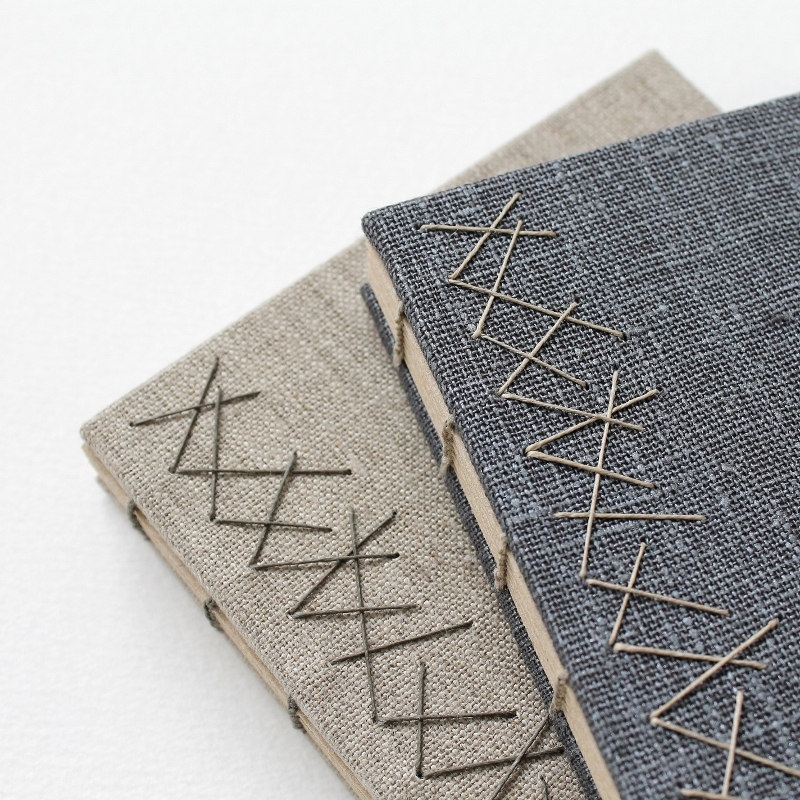 Of course the exposed sewing on plain Coptic bindings is super attractive, but it's nice to have some more variety. Both books are now for sale in my Etsy shop. You can find the tall one here, and the squarer one here. 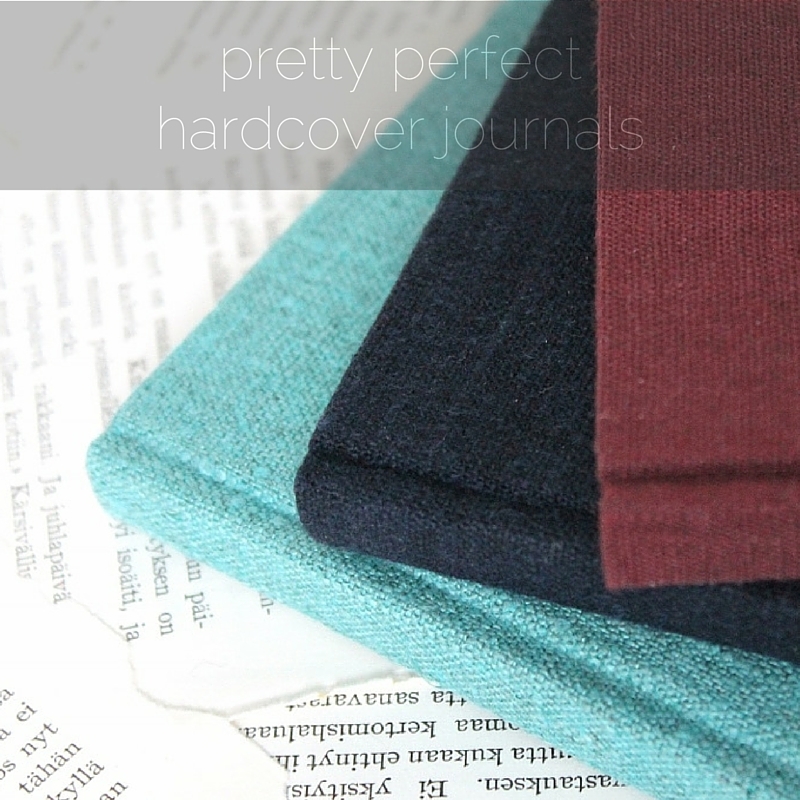 I added a nice lot of new hardcover journals/sketchbooks/notebooks to my Etsy shop yesterday. From the outside these may look like super plain books, but I'm pretty excited about them! I've once again nixed everything extra from the spine and gone with just a strip of mull, so these books open really nicely (but withstand use perfectly well enough). 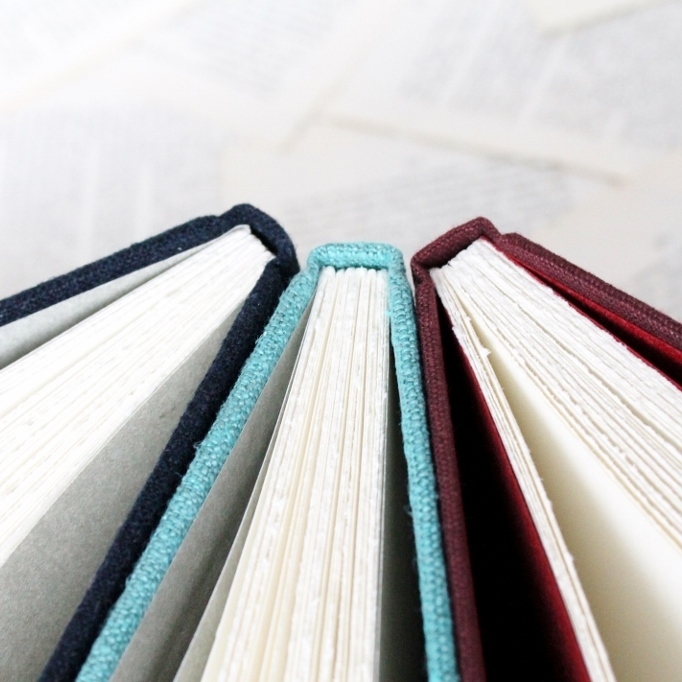 And they're the first books I've made with my lovely new Munken drawing paper. The paper is lusciously thick without being too stiff (I'm not a big fan of pages that feel like card stock) and it co-operates really well with any type of pen or pencil. I do my best to let nothing go to waste, so I often tear my big sheets of paper to size by hand (actually, I use a ruler, a bone folder and a bookbinding knife, and get a lovely rough but straight edge) taking advantage of the whole sheet. My paper cutter isn't big enough to cut large sheets, and it's not as accurate as I'd like, anyway, so if I opt for cut edges I usually do it with my plough (which gives super super smooth edges for the book block). 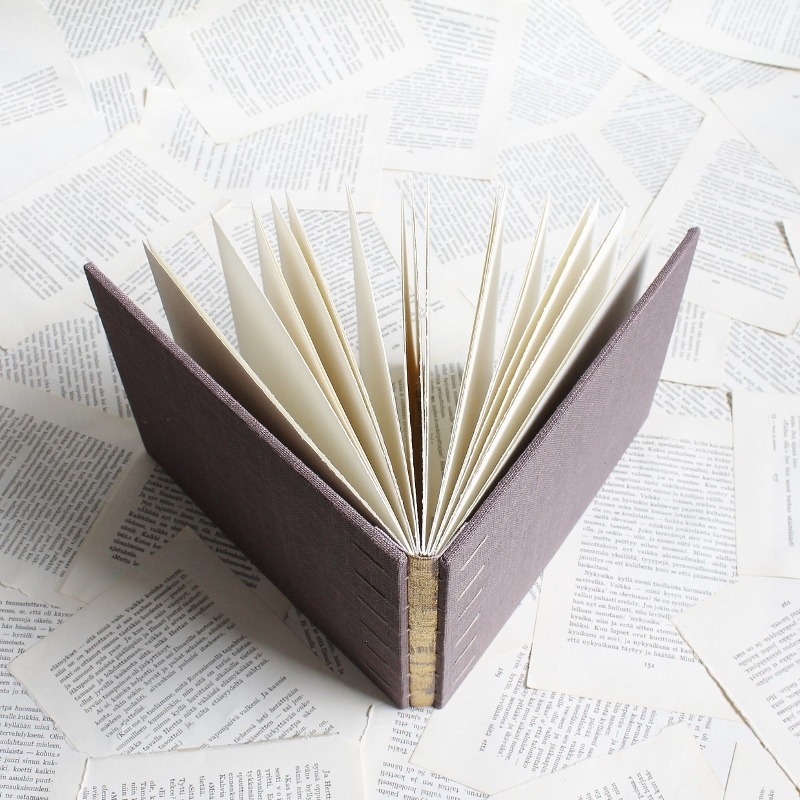 I'm not really worried about that little bit of waste that comes from tidying up the edges with a plough, but I do like to plan the sizes of my books in a way that allows me to get the maximum amount of use from a large sheet of paper. Usually I end up with two or three pages for a larger book and a few for a couple smaller ones from one sheet, unless I'm making something really simple working with quarters or eights or sixteenths. 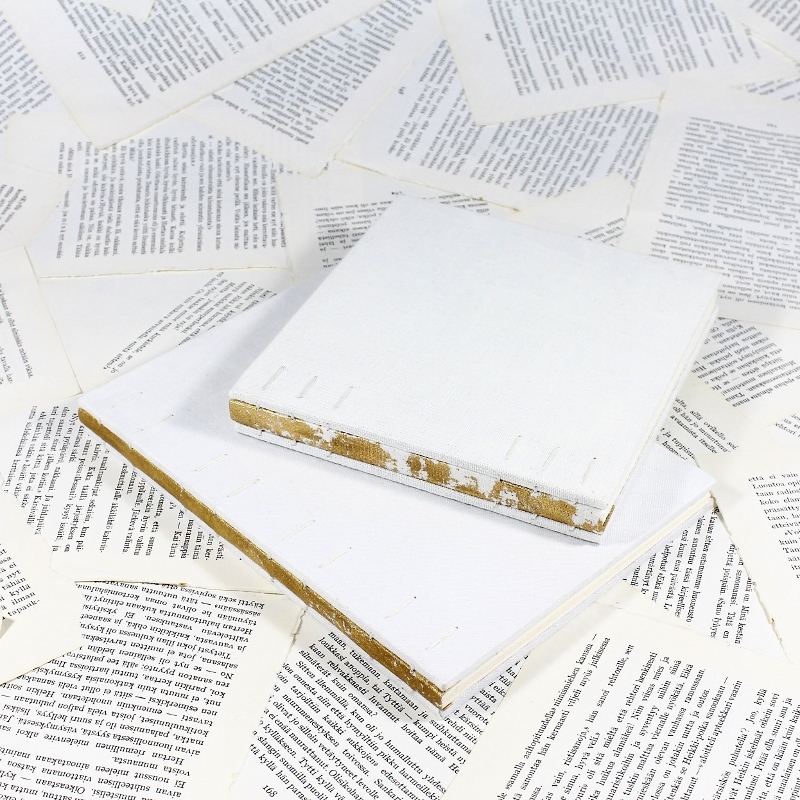 These Munken sheets (at 45x64cm) have quite pleasing proportions to offer for books made like this as the grain goes along the short side, which is pretty rare and feels like a special treat after years of working with mostly long grain sheets. It's a new world of possible sizes! I also finally have a decent yellow linen fabric in stock again! It's not as mustard-y as the one I had before, but it's still quite nice - maybe I'd describe it as a bright saffron yellow. They gray here is a bit of a nightmare to photograph! It looks so different in different lighting, but most times it has a greige tint to it. 96 pages of white 120gsm paper ( 17,5x21,7x1,7cm / 6.9"x8.5"x0.7"
One more book before takeoff. Tomorrow evening I'm far away, hopefully not thinking about work or home at all. I'm planning to visit the 1000 Years of the Art of Japanese Books exhibition at Brunei Gallery, though, so I'm not exactly taking a vacation from all things book related. I'm definitely taking a vacation from the heatwave we're now in the middle of. Too hot, too much sunshine, too many people with too little clothes on. I seriously can't quite grasp the concept of summer. It's not even supposed to be here yet. At least not like this.